As I’ve mentioned previously, I love the detail and originality of Playmobil toys. A reader named Sven recently wrote to show off his Playmobil installations, which are simply awesome. He’s got Rivermead Manor, a highly-customized mansion with all kinds of neat details (like Egyptian busts and mounted deer heads). He also gives some pointers on kitbashing accessories like spooky candelabra. The site is all in German, but there are plenty of pictures. His newer site is Playzombies, which includes a stern warning about the toy-on-toy violence contained within. Playmobil zombies have come back from the dead, to feast on the plastic of the living. Both of these sites are wonderful sources of inspiration, should you feel like playing with toys and calling it art. I’ve already got a little Playmobil ghost who sits on my desk and glares balefully at me. I’m thinking that I might need to collect a couple more figures and turn them into a little vignette. I’m always looking for new ways to keep people away from my cubicle. Go check out Sven’s work, and be inspired yourself! 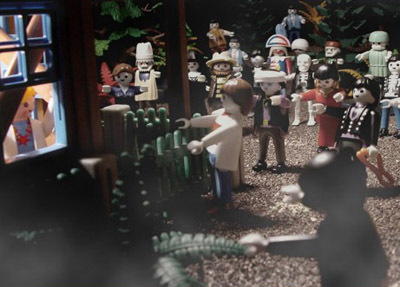 Hey, wouldn’t it be fun to remake a scene from the Crow with playmobil?!? have you ever looked at http://www.thebricktestament.com/? I think it adds a bit more of the macabre to the Playmobile stuff by the fact that all the figures have huge grins on their faces. I love it!!! BTW, Toys R Us now sells Playmobil. I saw it there about a week ago!